Free Spirits is a well maintained, spacious OCEANFRONT duplex property comfortably appointed and furnished. The A (East) side has 4 bedrooms and 4 bathrooms. The bathrooms are large - 3 with double sinks; the other with a tub/shower and shower stall. There is a washer/dryer closet centrally located on first floor. Large decks are off the front and backside of the home. The ocean views are gorgeous. Both sides of the duplex can be connected by an interior door when both sides are rented together. There are folding tables in a bedroom to extend dining space. This home has a fully stocked kitchen, ceiling fans throughout, 3 cable TVs, DVD, wireless internet, and an outside shower with hot and cold water. The A side sleeps 8: Queen bed downstairs with a private deck on street side. 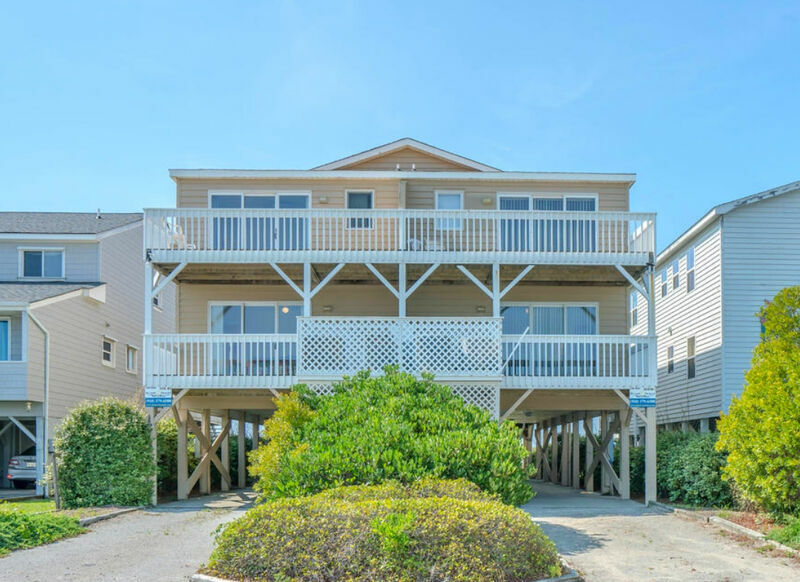 Upstairs: 2 twins on the street side with a deck; queen in the middle room with a large bath, and oceanfront master bedroom with a king and ensuite private deck to enjoy that morning coffee. Beach access at 1318 E. Main St.